Crunchy distortion goodness with outstanding tweakability. The Fat Sandwich Distortion represents an advanced era in guitar pedal design for Way Huge. In addition to carrying on the Way Huge tradition of amazing tone and rugged construction, the Fat Sandwich Distortion Pedal delivers heaps of crunchy distortion goodness via its innovative multi-stage clipping circuit. Meticulously designed from the ground up, the passive tone stack was tuned to bring out the "sweet spot" with any guitar and amp combination. The Volume control produces tons of output, making it ideal for driving the headroom out of the most powerful tube amps. Additionally, the Fat Sandwich guitar effect pedal has two internal mini controls: the Curve knob lets the user fine-tune the corner frequency of the overdrive filtering and the Sustain control adjusts the gain of the final distortion stage. 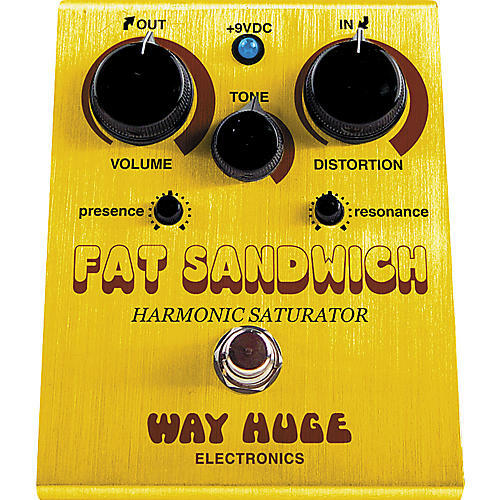 The Fat Sandwich is versatile and over the top ” the consummate distortion pedal for any genre of playing style. Each pedal has been rigorously tested to ensure quality, durability, and reliability and will deliver many years of exceptional performance. All Way Huge guitar pedals feature: heavy-duty footswitch with quiet relay-based true bypass, blue LED indicator, 2.1mm power jack with AC protection, easy access (non-detachable) battery door, super-duty .09 aluminum anodized chassis, high grade components, great tone and cool name. Launched in 1992 by Jeorge Tripps, Way Huge Electronics began as a result of Tripps' search for great tone, and his desire to perform with reliable, rugged and pedal board-friendly effects that had the magic of his coveted vintage pedals. The very first pedal ” simply labeled "Fuzz Box" ” was quickly followed by such staples to the product line as the Red Llama Overdrive, Foot Pig Fuzz and Green Rhino Overdrive II, which quickly found their way into the hands and onto the pedal boards of the world's guitar elite. Ensuing years would see the introduction of pedals such as the Swollen Pickle Jumbo Fuzz, Aqua-Puss Analog Delay, and the Saffron Squeeze. Over the span of a few years, Tripps helped revolutionize what would later be known as the 'boutique' effects market. In late December 1999, the company closed its doors as Tripps pursued other opportunities, sending demand for Way Huge products soaring, and driving online auctions well into the hundreds ” sometimes thousands ” for used Way Huge pedals. Now teaming up up with Dunlop, Way Huge pedals will once again be available to the masses, so all can enjoy their finely tuned electronics, high-grade circuitry and road ready construction, built under the watchful eye of Mr. Huge himself. When it comes to big tasty distortion, pile it on! Order up.